This unit is powerable by either a stock or modified Bachman 0-4-0, as well as a shortened Kato SPUD 2-axle drive unit. The kit is available now. 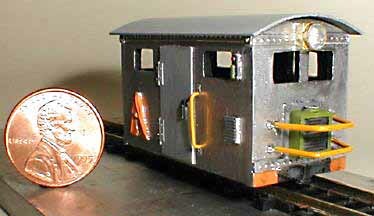 The unit - if powered by the Bachman 0-4-0, can easily be re-gauged to HOn3. 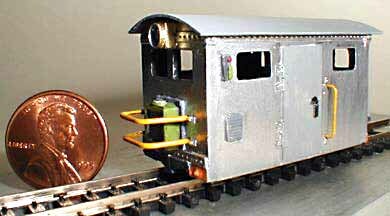 The unit is too narrow to power for standard gauge HO, but looks great as a static model! 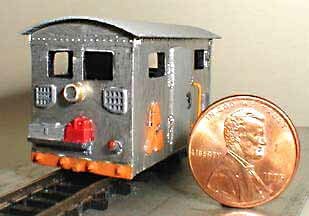 This locomotive is loosely based on the "Silver Sightseer" from the East Broad Top railroad. Model is a 4 wall castings, with a lot of extra detail (radiator, vents, gasoline can, etc.). The roof, drive unit and handrails/guardrails are not included. Choose this link to see plans in .pdf format. 1) Castings - 4 walls (front, back, left and right sides) with a lot of cast-in detail, such as gasoline tank and fill pipe, radiator, hinges and door handles. 2) Information on how to modify a Kato spud unit and Bachman 0-4-0 or other similar drive. The roof, drive unit and handrails/guardrails are not included. The pricing is as follows: Kit is $28.00; Connecticut residents must add 6% sales tax. Please include $3.00 for regular "snail-mail" shipping to US, Canada, Puerto Rico, U.S. Virgin Islands, Mexico and APO/FPO addresses in the U.S. If you want Priority Mail it's $5.50 . For those in other countries, please contact me privately at rrdesign@mrollins.com to discuss payment and shipping. The roof, drive unit and handrails/guardrails are not included. Note the Kato SPUD is carried by the fine folks at B & F Hobby Shop, Bakersfield, CA. You can e-mail them or view their Website. The following pictures show the painted model as built from the kit. The disk-shaped copper object is a US penny (7.5 mm diameter). The roof, drive unit and handrails/guardrails are not included in the kit. The unit - if powered by the Bachman 0-4-0, can easily be re-gauged to HOn3. 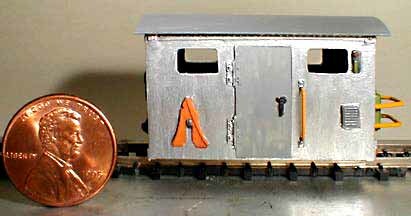 The unit is too narrow to power for standard gauge HO, but looks great as a static model! To see some information on real speeders, look here.